Missy cracks us up every day. She is super active, but at times can be calm, gentle and is very intense and serious about grooming sessions. She also likes to use tools to groom herself. She doesn’t sit still for long though—every day she runs so fast around the playroom chasing Annie or on the hill just for the fun of it. Like Burrito and Foxie, she’s pretty goofy, has a great sense of humor, and will even sometimes crack herself up. She’s super energetic and has the ability to get just about anyone to play with her. On Young’s Hill she seems to prefer to be an acrobat, and often times will walk along the firehoses like a tight rope rather than the structures themselves. To her that probably is just more fun. It’s awesome so see her enjoying herself so much. April 25, 1987: Male infant live born Day 229 of gestation. Showed a great deal of affection towards the infant but did not know now to carry him to breast or suckle him. 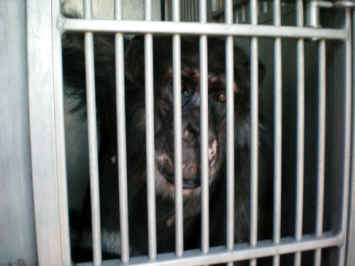 Her behavior did not improve over the following week, during which time nutritional maintenance was given, and the baby was removed permanently to the nursery for rearing. June 11, 1989: Female infant born Day 229 of gestation. Did not pick up infant at all, which was therefore removed to the nursery for rearing. July 14, 1991: Stillborn female infant Day 225 of gestation. 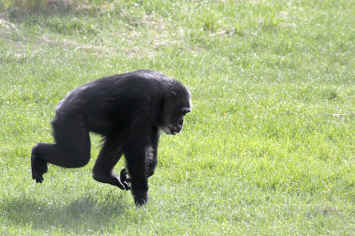 In Late 1992 she moved back to Buckshire, where she lived, warehoused, until being rescued by Chimpanzee Sanctuary Northwest in 2008. 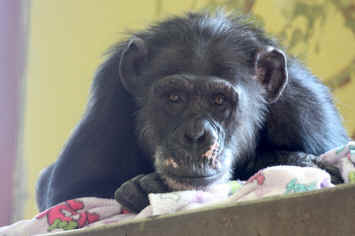 Though her records do not indicate she was being used in any active biomedical research protocols during these years at Buckshire, just like the other chimpanzees there, Missy was routinely knocked down for blood draws, physicals, and tuberculosis tests. Today Missy is brave, easy-going, playful, and full of energy. It’s very hard to think of her stuck in small cages no bigger than a coat closet when she runs, full speed, across the open-air enclosure of Young’s Hill and scrambles up tall posts without a second thought.